"Ibn Bal'am came from a respected family in Toledo, and settled later in Seville. In his old age he devoted himself to the study of law [that is, to theology]. He possessed a quick comprehension and an excellent memory. His style was direct and terse, so that he could present comprehensive subjects in a few words. His literary work extended especially to compendious treatises, in which he availed himself of the thorough and comprehensive studies of his predecessors, but from which he extracted with care only their most essential and valuable contents. . . . Against his otherwise noble character and sedate nature his irritable temperament stood in marked contrast. Nobody escaped his criticism, which consisted not merely in the pointing out of faulty passages, but in a trenchant and ruthless analysis of their errors." This characterization is fully borne out by Ibn Bal'am's writings. Ibn Bal'am wrote altogether in Arabic. Some of his works are known only from quotations or references, by himself or by others. Those of his writings which have been preserved are partly in Arabic, partly in Hebrew translations. The following works are known to be his: (1) "Ta'lif fi al-Muṭabiḳ wal-Mujanis" (in Hebrew, "Sefer ha-Tagnis"), on Hebrew homonyms, still unpublished. Only a fragment of the original Arabic has been preserved (see Poznanski in "R. E. J." xxxvi. 298). (2) "Ḥuruf al-Ma'ani" (in Hebrew, "Otiyyot ha-'Inyanim"), on Hebrew particles. Its publication was commenced by S. Fuchs in "Ha-Ḥoḳer" (i. 113 et seq. ), but was not finished. Fragments of the original Arabic are to be found in the notes to Ibn Janaḥ's "Kitab al-Uṣul," published by Neubauer. (3) "Al-Af'al al-Mushtaḳḳah min al-Asma'" (in Hebrew, "Ha-Pe'alim Shehem mi-Gizrat ha-Shemot"), on verbs; published by G. Polak in "Ha-Karmel" (iii. 321 et seq. 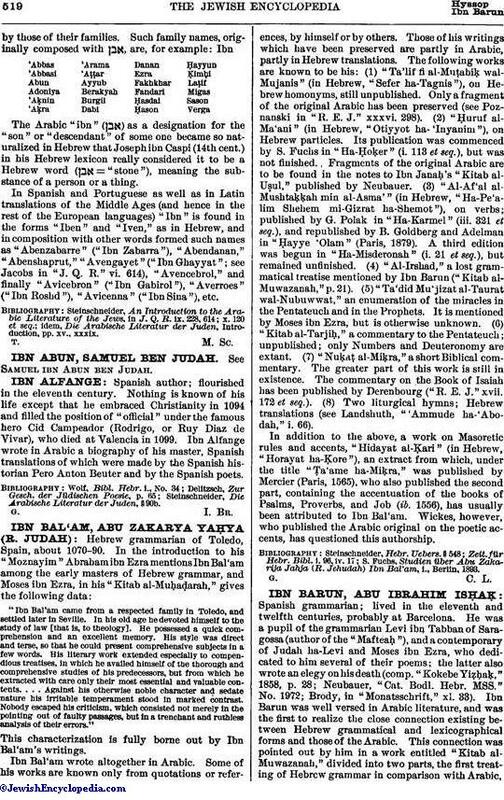 ), and republished by B. Goldberg and Adelman in "Ḥayye 'Olam" (Paris, 1879). A third edition was begun in "Ha-Misderonah" (i. 21 et seq. ), but remained unfinished. (4) "Al-Irshad," a lost grammatical treatise mentioned by Ibn Barun ("Kitab al-Muwazanah," p. 21). (5)"Ta'did Mu'jizat al-Taurat wal-Nubuwwat," an enumeration of the miracles in the Pentateuch and in the Prophets. It is mentioned by Moses ibn Ezra, but is otherwise unknown. (6) "Kitab al-Tarjiḥ," a commentary to the Pentateuch; unpublished; only Numbers and Deuteronomy are extant. (7) "Nuḳaṭ al-Miḳra," a short Biblical commentary. The greater part of this work is still in existence. The commentary on the Book of Isaiah has been published by Derenbourg ("R. E. J." xvii. 172 et seq.). (8) Two liturgical hymns; Hebrew translations (see Landshuth, "'Ammude ha-'Abodah," i. 66). In addition to the above, a work on Masoretic rules and accents, "Hidayat al-Ḳari" (in Hebrew, "Horayat ha-Ḳore"), an extract from which, under the title "Ṭa'ame ha-Miḳra," was published by Mercier (Paris, 1565), who also published the second part, containing the accentuation of the books of Psalms, Proverbs, and Job (ib. 1556), has usually been attributed to Ibn Bal'am. Wickes, however, who published the Arabic original on the poetic accents, has questioned this authorship. S. Fuchs, Studien über Abu Zakarija Jahja (R. Jehudah) Ibn Bal'am, i., Berlin, 1893.